As most of you know, we are firm believers that all gaited horses should be centerfire rigged, that is, all four corners of the saddle should be cinched down. In the "Educational Portal" section of our website there is a video of Bobby Beech explaining how to do this the traditional way using two long tie straps. The Stablizer Strap idea came to us from one of our customers who is an avid endurance rider. The strap runs through the buckle on your girth to the rear rigging "D" on your saddle and then drawn tight. They are meant to be drawn as tight as the front cinch. When the rear of the saddle is drawn down into its proper position, pressure in the shoulder region is relieved. 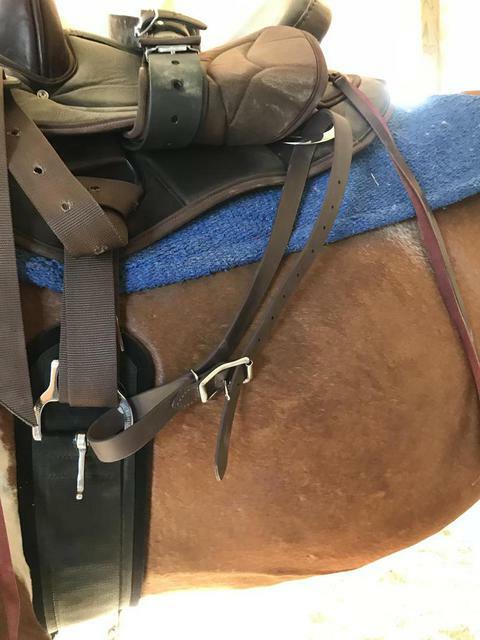 The stabilizer straps are so effective that we now include them on every saddle we sell. Brown or Black beta material available with stainless steel or brass hardware. ***Please call 1-800-251-3474 for any questions regarding this product.